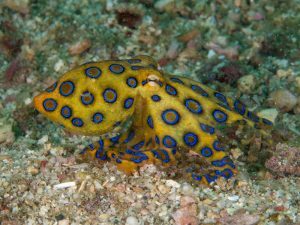 Among the most fascinating creatures to adorn the reefs from the Sea of Japan to Australia to Vanuatu is the Blue-ringed Octopus (Hapalochlaena lunulata). Despite its donut-shaped brain and three hearts, there is no “plush toy” potential in this creature. The palm-sized swimmer of the snail family has a bite 1000 times more toxic than cyanide (overkill, if you ask me). It also is a master of camouflage; yet, when provoked, turns a startling yellow with pulsating blue spots. And, if it does get into a limb-tearing tangle with a predator, any of its eight arms conveniently will grow back. This way cool fish is a beauty and a beast that is best admired from afar.